Figure 1: The stereo microscope is an essential tool when attempting to rework or repair modern circuit board assemblies. Microscopes are essential tools in the rework and repair department. While there have been many applications for other types of manually-operated vision systems, such as illuminated magnifiers and CCTV based systems, the importance of microscopes has been driven by the ever-shrinking size of electronic components, connections, and assemblies, and the spaces between adjacent components. Microscopes used in this scenario are almost exclusively stereo zoom microscopes, which offer depth perception for the operator and the ability to zoom in for close work or to zoom out to check the work in relation to the surrounding circuit board topography. It should be noted that the role of the microscope in rework is not one of inspection, but that of a tool under which the operator works; rework is performed while viewing, as differing from viewing or inspecting after the task is completed. Stereo microscopes used for rework see constant use and require certain features to make them flexible enough for the demands of the job. Looking through a microscope during an entire shift can be stressful, and create strain on the neck and back. Ergonomics are important; any microscope can be uncomfortable to use for extended periods of time, the user bent forward, eyes pressed to the eyepieces, rigidly trying to adjust, focus, and hold steady position to avoid "black spots" at the edge of the narrow field of vision that result from incorrect eye positioning in the scope. Neck aches, stiffness, backaches, eyestrain, and headaches are often the afflictions associated with extended microscope use. Workers need to take frequent breaks to stretch, relieve stiffness, and change position. Uncomfortable workers can't properly focus and deliver quality work. Pain and discomfort are distracting, and less than optimum work quality can result. An ergonomically designed microscope will have an incline or angle so that the operator will not be looking straight down at the workpiece. We have modified microscopes on our own so that we can move the head with special elbow mechanisms to any angle our operators want and lock it in place. 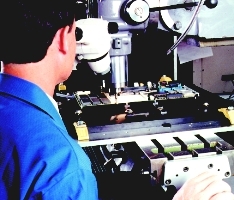 Figure 2: Stereo microscopes can be mounted to milling machines when that extra level of precision is needed. It is also important that the microscope has independent focus ability on each eyepiece to allow individual operators to adjust the scope to their own vision variations and requirements. In our own experience, we have found that zoom capability is very important. Operators need to be able to zoom in tight to a critical area, and then be able to back away to view the workpiece on a larger scale. A zoom range from 9X to 40X is desirable; some microscopes include a .5X supplementary lens that reduces the zoom range to 4.5X-20X. As far as lighting is concerned, we favor fiber-optic or halogen lighting. They're intense, but close to natural light. Gooseneck arms allow adjustment and repositioning to eliminate glare, which can bounce up into the operator's eyes. Our operators often prefer using more than one light source, such as two halogen lights on the workbench, or a dual point fiber-optic illuminator with focus adjusting lenses, so they can inspect critical areas with extreme accuracy. Having two light sources helps the operator eliminate shadows to see every aspect of the workpiece clearly. This gives the operator an ability to "tailor" the illumination by directing the angle and proximity of the light sources. The issue of ESD safety in a microscope is an important one. Too often, manufacturers will go to great lengths to protect and ground everything in contact with the operator and the bench top, only to forget a potential source of ESD suspended right above the workpiece. Protect the product being reworked from potential ESD damage by making sure that the microscope is properly grounded. As rework advances and the dimensions of electronic assemblies shrink, the microscope will become an increasingly essential tool for successful rework. Making sure that the microscope has the needed features, flexibility, and ergonomics will ensure quality workmanship from the beginning of the shift until the end.